In this free, live webinar, the authors of the research report, "Beyond the Hype: The Hard Work Behind Analytics Success" will share the findings and insights from their research. The presentation will be followed by a live Q&A session with the speakers. 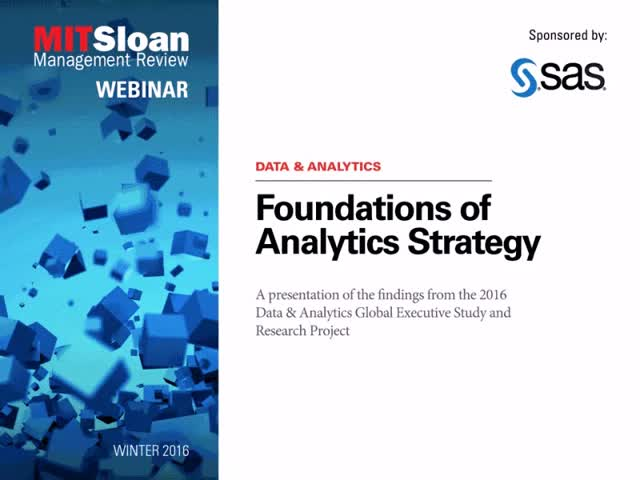 The research found that organizations with successful formal analytics strategies exhibited four key characteristics: executives are both proponents and users of analytics; managers blend analytics and intuition when making decisions; analytics is applied strategically; and analytics initiatives help with both optimizing operations and improving strategic decision-making. * openness to new ideas to cultivate both innovation and competitive advantage with analytics. * signals about the importance of analytics, including data councils, data labs, and centers of excellence. * blending analytics with intuition in decision making. Join Thomas French, Industry Consultant, SAS for a live Q&A interview at RSA Conference 2019 to learn more about the key trends in digital identity and authentication, specifically in the Financial Services industry. "As cyber threats continue to grow, cyber vigilance is more critical than ever. How are CISOs and their security teams addressing the threat of cyber attacks like phishing, IoT-powered DDoS attacks, crippling ransomware or other attacks? How prepared are today's businesses to detect an attacker or launch the appropriate response? - Recommendations for improving security and steps to take today"
Artificial Intelligence and Machine Learning are the latest buzzwords in the technology bingo game and with so many vendors touting machine learning’s and AI’s prophetic revolution, it’s tough to filter out the wheat from the chaff. In this session we’ll do just that as we discuss practical approaches to effectively leveraging AI and machine learning (ML) to combat fraud, waste and abuse. We’ll also provide some food for thought around best practices, what to expect and how to get started with AI and Machine Learning. Mike Ames is an Adjunct Faculty Member in the School of Business at Wake Forest University and currently leads the Applied Data Science and Emerging Technology groups for SAS’ Fraud and Security Intelligence Division. Ames has extensive consulting experience working with a diverse range of customers to develop a variety of analytic and enterprise applications. His current area of focus includes the use of artificial intelligence, robotic process automation and machine learning to combat fraud, waste and abuse. Since joining SAS in 2002, he has brought over a dozen products and solutions to market. He received his undergraduate degree in economics from the University of Georgia and his MBA from the University of North Carolina at Chapel Hill. In this first part of our two-part webinar series, we aim to cover some of the challenges and opportunities when investing in IoT as well, highlight some of the solutions that can be leveraged to obtain desired outcomes, showcase the benefits of the Cisco – SAS validated design program and demonstrate how Cisco and SAS work together in the IoT Ecosystem. Marketing, merchandising and supply chain are the pillars of the retail business. Aligning these processes may sound easy, but it can be much more complicated than it seems. Connecting omnichannel data and analytics is the key to success in the competitive world of retail. The abuse of prescription drugs continues to rise across the United States, and the impact on child welfare is great for both children and those parents who abuse. Recent national data shows parental alcohol or drug abuse was the reason for removal of almost 31% of children placed in out-of-home care in 2012 and has continued to rise. SAS will share how prescription drug monitoring programs can be used to change the way systems address the problem and provide for better informed decision making and innovative solutions. Financial institutions are turning to artificial intelligence (AI) to automate manual processes, emulate human decisions, and improve the accuracy of surveillance strategies. Given the sophistication of fraud attacks and ever increasing regulatory scrutiny, firms are implementing advanced analytical approaches to be more agile, effective, and efficient. Join this webinar to hear experts across a range of fields in security analysis and investigations discuss how analytics can help. Today’s government and commercial health care market is in a constant state of change. Both government agencies and private insurers need to bring value through more effective claims, clinical targeting and revenue optimization. And payers are looking for single-source system that delivers an innovative, broad spectrum of services to fill gaps in their existing processes and improve outcomes. During this session we’ll look at a payment integrity approach that delivers results. We’ll also share case studies to show how you can use analytics to create measurable financial impact for both government and commercial payers and providers. When analytics is added to the picture, the Internet of Things has the power to radically change our world, because data-driven insights are the real source of value in the analytics economy. This session explains the nature of this economy and discusses why the IoT might also be properly defined as the Intelligence of Things. Garret Fitzgerald of GE Transportation will join Randy Guard to provide a real-world example of how edge analytics adds more intelligence to the IoT. Fitzgerald will share how his company is using the power of IoT analytics to completely reshape its business. With implications and applications for multiple industries, the solution is relevant to anyone who seeks to capitalize on the promise of an intelligent, connected world. Incremental improvements in supply chain operations are no longer enough in the competitive aerospace marketplace. Advanced analytics are key to enabling step-level changes, but developing and implementing those analytics requires an organization that can develop, implement, interpret and act on the same. This session will explore the challenges involved and how to address them. Discussion points include understanding what drives the need for analytics, what gets in the way and critical success factors. We'll also examine case studies on what can happen with 13 weeks, a motivated team and a value proposition. Cleveland Clinic is a nonprofit academic medical center that integrates clinical and hospital care with research and education. With this mandate, analytics has been at the core of much of what Cleveland Clinic delivers. While the use of analytics has always been important, it has continued to evolve over time. Today, we focus on enabling as many people as possible to harness insights from data that ultimately drive front-line interventions and improved outcomes. In support of this effort, Cleveland Clinic initiated a comprehensive, enterprise program to accelerate the transformation into an analytically mature organization. The program is built on the four pillars of data, people, process and technology. It's intended to empower Cleveland Clinic caregivers across the enterprise, from data scientists to entry level analysts. Join Chris Donovan as he describes the analytics journey at Cleveland Clinic and how it is continuing to refine and refocus as data and analytic technology continue to expand and push new limits. The ability to analyze high-velocity data in motion is increasingly of interest to organizations and civic leaders, enabling access to real time information for decision makers through event stream processing. This is imperative not only in sensor driven industries like health care and manufacturing, but also for large scale public events with issues related to public safety, transportation and overall experience for tourists and residents. The Center for Statistics and Analytical Research at Kennesaw State University used SAS® Event Stream Processing to analyze tweets from the 2017 Boston Marathon and determine topics, patterns and trends to provide insight for future large scale events. Attributes of interest from each tweet such as contents, timestamps and locations were identified and captured. The output was then filtered by US time zones. Two counter windows, global and EST (where the Marathon was held), were used to count the number of incoming tweets in a 10 second sliding window. The information was then displayed on a dashboard. The results were analyzed over the timeline of the marathon to correlate Twitter activity to the event itself. In addition, key topics were analyzed to determine propensity for co-presence, such as pain+Advil. Catherine Truxillo, Director of Analytical Education at SAS, provides an overview of the academy including the content, certifications, free trial and self-paced eLearning version with a Q&A session at the end of the webinar. Watch this webinar and discover how to grow your own data science skills or how to transform your workforce. This webinar highlights the key take-aways for the health care industry of a major multi-year global research study sponsored by SAS, which is conducted by MIT Sloan Management Review. This most recent study uncovers key factors of business-driven innovation, including cultural and process factors, the pivotal role of data governance, and burgeoning opportunities with machine learning and artificial intelligence. This webinar highlights the key take-aways for public sector entities of a comprehensive multi-year global research study sponsored by SAS, which is conducted by MIT Sloan Management Review. This webinar highlights the key take-aways for the manufacturing industry of a comprehensive multi-year global research study sponsored by SAS, which is conducted by MIT Sloan Management Review. The most recent study uncovers key factors of business-driven innovation, including cultural and process factors, the pivotal role of data governance, and burgeoning opportunities with machine learning and artificial intelligence. This webinar highlights the key take-aways for the banking industry of a major multi-year global research study sponsored by SAS, which is conducted by MIT Sloan Management Review. In today's organizations, you need to get relevant data quickly to drive faster business decisions. With big data, sometimes that's easier said than done. SAS® Business Intelligence offers predictive insights with the ability to understand the past, monitor the present and predict outcomes, no matter the size or complexity of your data. In fact, SAS helps you deliver accurate, valuable information – from Hadoop or any other big data source. Plus, SAS offers an integrated, flexible presentation layer for the full breadth of SAS Analytics capabilities: data and text mining, statistics, predictive analytics, forecasting and optimization. One of the key components of SAS Business Intelligence, SAS Visual Analytics, offers self-service data discovery, enabling even nontechnical business users to explore billions of rows of data in seconds. With this tool, you can discover more opportunities and make more precise decisions, easily publishing reports to the Web and mobile devices.